12/24V GENUINE LUCAS SSB103 FIXED HANDLE BATTERY ISOLATOR SWITCH. Genuine Lucas SSB103 switch. 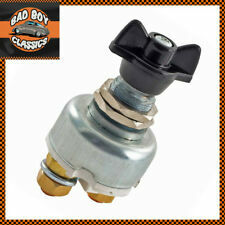 Fitted to various classic cars including: Aston Martin, Austin Healey, Land Rover, MGA, Morris. Max load 500A (12v) 250A (24v). LUCAS STYLE BATTERY CUT OFF SWITCH SSB106. 89MM TOTAL LENGTH. REQUIRES 19.5MM HOLE TO FIT. 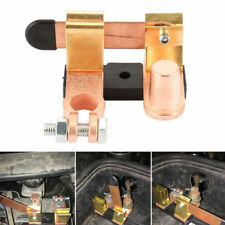 The easy way to disconnect electrical power on any vehicle without tools. Simply lift the knife power is cut. Prevents shorts and fires when working on electrical systems discourages theft, idle batteries. Replacing Lucas: SSB106. 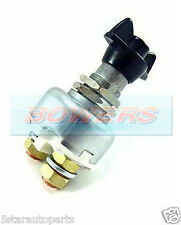 12/24V LUCAS STYLE FIXED HANDLE BATTERY ISOLATOR SWITCH. Rated 100A continuous and 500A max for 5 seconds. Heavy Duty Fixed Key Battery Isolator Switch. 150A @24V continuous, 1000A @ 24V for 10 seconds. Suitable for 12v & 24v Applications. Suit 12volt & 24Volt. Requires a mounting hole 22mm and 2 x 6.5mm bolt fixing holes 37mm apart. Simply remove the red key todissconnect the battery. Heavy Duty Battery Cut off SwitchFIA COMPLAINT. SIMPLY REMOVE KEY TO DISCONNECT. 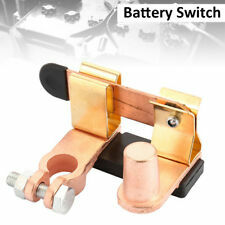 12V / 24V HEAVY DUTY BATTERY CUT OFF SWITCH. Max load 2500A @ 12V for 5 seconds. 24v Heavy Duty Battery Isolator Master Cut off Switch. 250A continuous @ 24V. SUITABLE ALL 12v & 24V APPLICATIONS. Heavy Duty Battery Isolator Master Cut off Switch. COMPATABILITY IS A GUIDE ONLY THESE ARE UNIVERSAL AND CAN BE FITTED TO ANY VEHICLE. Simply remove the red key todissconnect the battery. This Is A Top Quality Switch At a Very Good Price. Genuine Sytec FIA APPROVED Battery Master Switch. Genuine Sytec 6ft (1.8m) T-Pull Cable. - Full FIA approved battery master switch. - Capable of sustaininga 90 Amp draw. 1pc x Switch with all weather collar and cap. Simply Remove or Loosen Wheel To Disconnect Power. BATTERY QUICK DISCONNECT CUT OFF SWITCH. Simply Bolt On Fitting. Takes Minutes To Fit. MARINE BATTERY CUT OFF SWITCH. 300 AMP CONTINUOUS 12V. 4 POSITIONS ALLOWS YOU TO SELECT BETWEEN BATTERY 1 - 2, BOTH OR OFF. Simply Remove or Loosen Wheel To Disconnect Power. BATTERY QUICK DISCONNECT CUT OFF SWITCH X2. Simply Bolt On Fitting. MARINE BATTERY CUT OFF SWITCH. 300 AMP CONTINUOUS 12V. REMOVABLE KEY. Replacing Lucas: SSB103. Durite Part Number: 0-605-02. 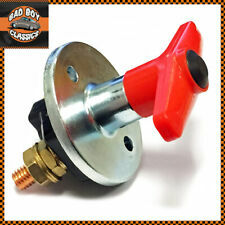 12/24V LUCAS STYLE FIXED HANDLE BATTERY ISOLATOR SWITCH. 24v / 12V Heavy Duty Battery Isolator Master Cut off Switch. Simply Remove Key To Disconnect Battery. SUITABLE ALL 24V & 12v APPLICATIONS. 200A continuous. 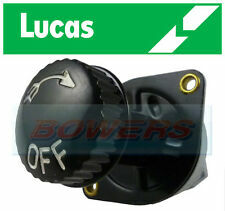 You are purchasing a Lucas Style Fixed Handle Key Battery Isolator Kill Cut Off Switch 12V/24V. Can't find what you need?. Top Quality Products. Contents (12 types). 10 x R10-6. 10 x R10-8. 10 x R16-6. 10 x R16-8. International Orders UK Orders. The XR Battery Isolator is the latest generation. Battery negative switching current: 550-650A Typical, 2000A surge. you will receive red buttons. Photo for illustration . Current consumption: 25mA ON, 0.1mA OFF. MISSILE TOGGLE. PREMIUM QUALITY IGNITION SWITCH PANEL. CARBON EFFECT ALUMINIUM. PUSH BUTTON START SWITCH. BATTERY CUT OFF. In the event that a part is supplied and proven to be incorrect or faulty, Hills Motors must be notified within 48 hours. We are unable to cover any labour costs. Negative Cable A0009052702. Year: 2012. Simply Remove or Loosen Wheel To Disconnect. BATTERY DISCONNECT CUT OFF SWITCH. FITS ALL STANDARD 6V, 12V & 24V BATTERIES. Simply Bolt On Fitting, Very Easy. Simply Remove or Loosen Wheel To Dissconnect. BATTERY DISCONNECT CUT OFF SWITCH. Simply Bolt On Fitting, Very Easy. Heavy Duty Battery Isolator Master Cut off Switch. Installing hole space: 40mm. Simply remove the red key todissconnect the battery. This Is A Top Quality Switch At a Very Good Price. AIRBAG BLOW CUT OFF LEAD POSYIVE BATTERY LEAD 9217031;. 2013 BMW 3 SERIES which we are dismantling. Green parts are also known as ‘recycled parts‘ or ‘used parts‘ and are manufacturer parts that have been removed from a vehicle during the dismantling and recycling process. Spec= 16mm² Cable. 12" EARTHING STRAP. 12" Battery Cable / Earthing Braid. Low cost world wide. Top Quality Products. Over 50,000 Products. International Orders at checkout. Heavy Duty Battery Isolator Master Cut off Switch. Simply remove the red key todissconnect the battery. This Is A Top Quality Switch At a Very Good Price. Installing hole space: 40mm. Battery Isolator Master Cut off Switch. Rather than the cheaper versions with this piece in plastic which wear quickly and often break. Installing hole space: 40mm. This Is A Top Quality Product At Affordable Price. Suitable for all Vehicles 12v and 24v. Heavy Duty Battery Cut off Switch. Max load 1400Amp @12Volt for 10 seconds. Simply remove the red key todissconnect the battery. This Is A Top Quality Switch At a Very Good Price. Removed From 2013 Range Rover Evoque 2.2 Diesel Engine code 224DT ( DW12 TE5 ) 6 Speed Auto Gearbox, Car Ref Number ( H3335 ) Auxiliary Battery and Module Part Number ( BJ32-110C693-AC ) age related marks see photos. Battery Isolator. Remarks Eliminates the multi battery drain when 2 or more batteries are in a charging system. Further information. Physical specifications. /batteries 2. MARINE BATTERY CUT OFF SWITCH. REMOVABLE KEY. 69MM X 69MM X 74MM. 300 AMP CONTINUOUS 12V. MANNOL Bandage Tapeis a polyester fabric tape that is used for bandaging cable harnesses in the automotive industry. It can also be used for insulating electrical connections. The tape is easy to handle, dirt-repellent, very supple and flexible. Consequently, it is far more flexible. Flexible Battery/Starter Cable. 50mm 396/0.40mm. Resistant to :Petrol, lubricating oils, and diluted acids. Flexible battery cable has many finer strands than the semi-rigid type. The first is to disconnect the Battery from all Electrical Circuits. The second is to kill the engine. When the negative side of the battery has been disconnected it will also cut the 12v output powering your Ignition or ECU. MANY MORE BMW PARTS AVAILABLE. YOUR BMW SPECIALISTS. RIGHT HAND DRIVE CAR. We will always help you to have a 100% positive happy buying experience. We will ALWAYS try our best to help. MANY MORE BMW PARTS AVAILABLE. YOUR BMW SPECIALISTS. RIGHT HAND DRIVE CAR. We will always help you to have a 100% positive happy buying experience. neutral or.